The Daytona photo unit is the latest model of cameras that OPTOMAP has released. It allows for more detailed photos of the back of the eye, which is important in tracking diseases, and also a wider field. 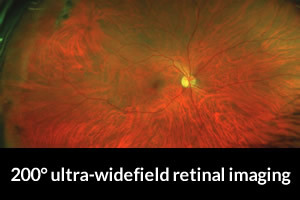 Taking a picture of the back of the eye can be a powerful tool to follow eye health over time. It allows us to detect subtle changes that may be missed otherwise. The Daytona unit gives us the ability to catch even more eye conditions than ever before!